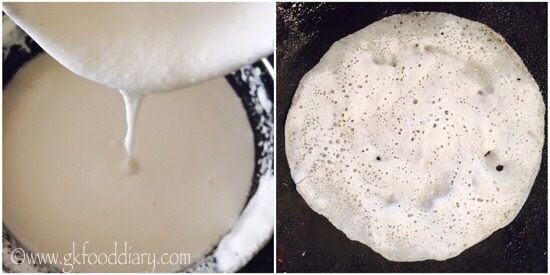 Coconut Dosa- easy, tasty breakfast/dinner recipe with Rice and coconut. 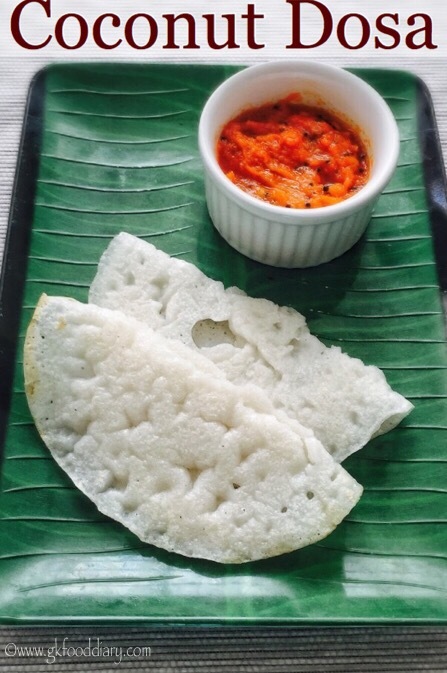 This coconut dosa is a nice variation to usual dosa varieties. It can be done quickly, only it requires soaking time as fermentation part is optional for this dosa. 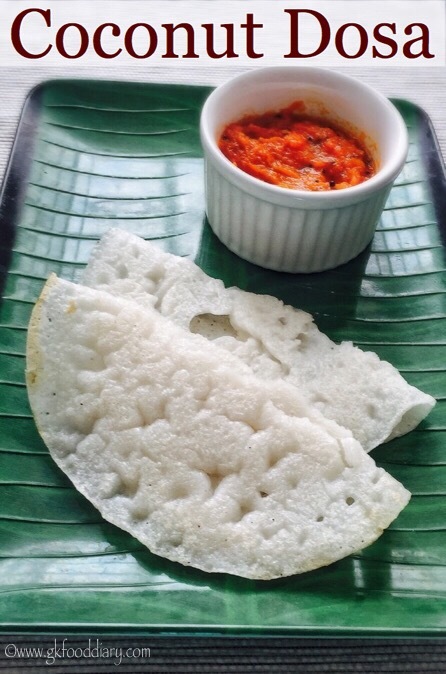 Coconut dosa is perfect as breakfast/dinner & can be served as such or with tomato chutney. 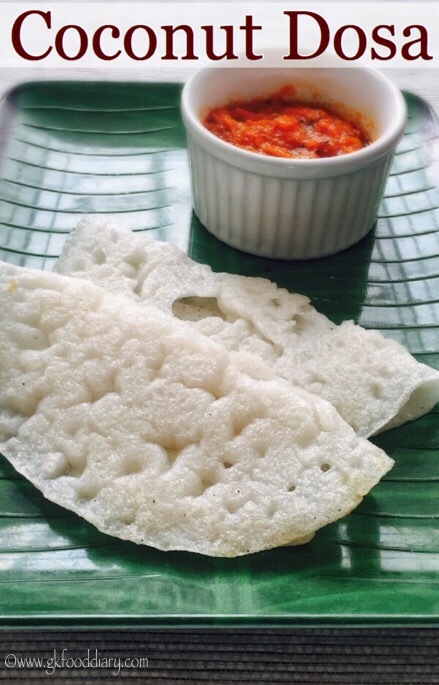 This coconut dosa can be given to babies from one year once they started eating all family foods! 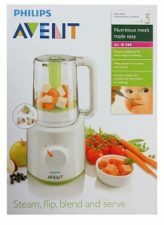 Now let’s get on to check how to make coconut dosa recipe for toddlers and kids. 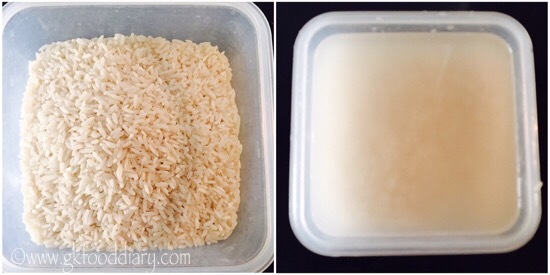 Wash and soak rice for at least 3 hours or overnight. Add in 1 cup of grated coconut to a blender. Then add soaked rice to the same blender. Start grinding the rice with grated coconut by adding little water in frequent intervals.Grind them to a smooth paste. Then transfer the rice coconut batter to a separate vessel. Now add required salt. Mix well. You can ferment the batter for 6-8 hours. Fermentation step is optional. The batter consistency should be slightly thin, add water accordingly before making dosas. For making dosa's ,Heat a pan, spread the dosa with one laddle of batter and drizzle it from the corners and finishing off in the middle. Drizzle oil and Cook it for 3 minutes. Once done flip the dosa and cook it for a minute. Remove from the pan once done. 1. Add in 1 cup of grated coconut to a blender. Then add soaked rice to the same blender. 2. 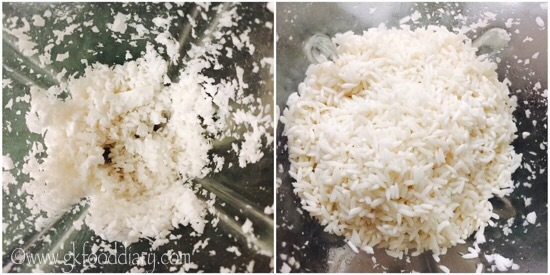 Start grinding the rice with grated coconut by adding little water in frequent intervals.Grind them to a smooth paste. Then transfer the rice coconut batter to a separate vessel. Now add required salt. Mix well. You can ferment the batter for 6-8 hours. Fermentation step is optional. 3. The batter consistency should be slightly thin, add water accordingly before making dosas. For making dosa’s ,Heat a pan, spread the dosa with one laddle of batter and drizzle it from the corners and finishing off in the middle. Drizzle oil and Cook it for 3 minutes. Once done flip the dosa and cook it for a minute. Remove from the pan once done. 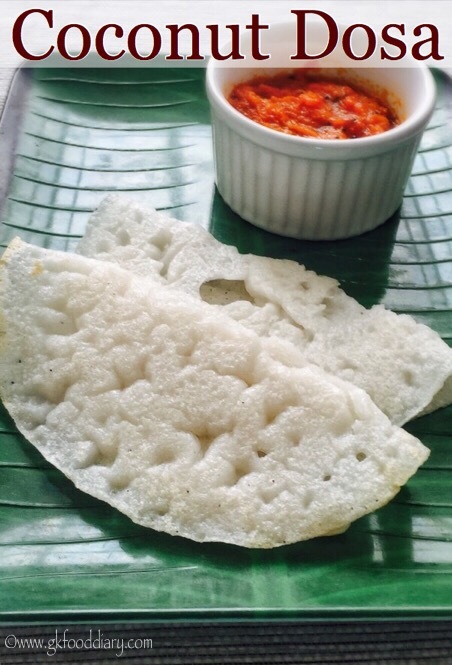 Serve the coconut dosa with chutney! You could also add 1/2 cup of finely chopped onions to the batter before making dosas. If you are not fermenting the dosas, give at least 30 minutes of resting time before making dosas. Make sure the dosa gets cooked well before you remove from the pan. You can also cook the dosa covered with a lid. 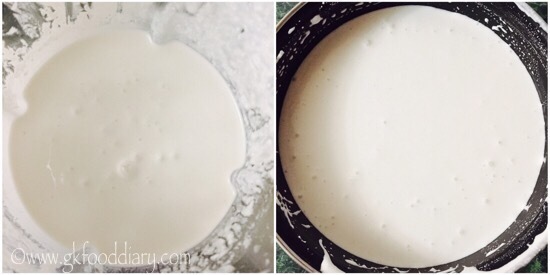 Do not spread dosa much and make the batter thin so that pouring is easy enough. Idli rice or raw rice works well for this recipe.